The Fire Within Yoga is more than just a place to take a class. Our mission is to empower students on and off the mat. We are honored to offer a space for you to tap into. Our practice is rooted in gratitude, and focused on building strength, balance, and flexibility through a challenging and energizing Yoga practice. By inspiring growth in the mind, body, and spirit, I believe we can create powerful good in the world. I hope you’ll join us on the mat. The Fire Within Yoga studio offers a variety of yoga classes in a welcoming environment. Located near Holiday in Buffalo, our certified instructors provide instruction in Barre, Aerial, Power Vinyasa, Yoga-Barre Blend, and Beginners' Yoga. Our studio is dedicated to providing yoga classes that emphasize proper alignment and technique while balancing physical conditioning and stress reduction. 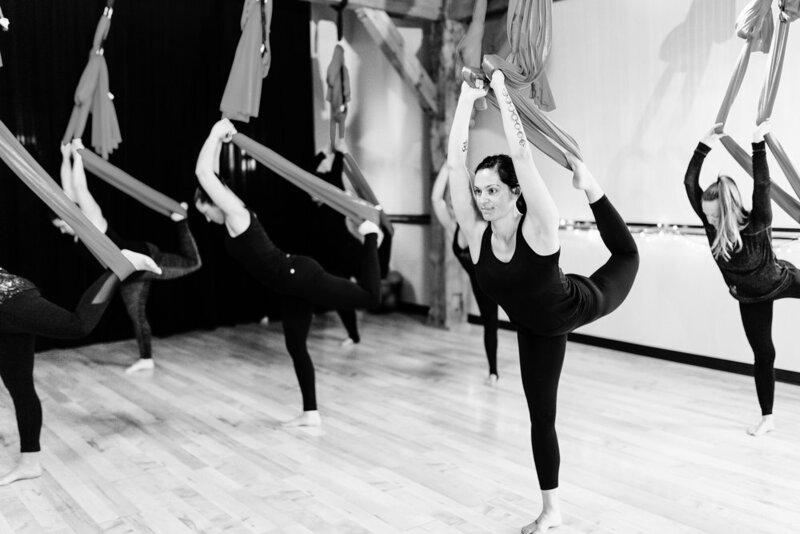 Take your practice to new heights with Unnata Aerial Yoga. This 60-minute class uses a fabric hammock to assist and enhance yoga postures. Email us to book your private aerial event, come fly with us!